A recent article in the sports section of The Montgomery Advertiser, written by a Tom Kuyper, postulated that sitting on the bench can be a positive learning experience for young children. The article seemed to be about novice players, learning the game, as well as the ‘pain’ of bench sitting, with the responsibility of philosophical acceptance, relegated to the parent. There seems to this writer, that there is an undercurrent of absolution to the coaches. Mr. Kuyper’s closing suggestion is:” I am hopeful that somehow you can find the good out of this hard time… Hang in there… soon be a dim memory… the lasting effects of positive character development will overtake the pain. “Gee son (daughter), I’m so proud you got to sit on the bench again, (even though we won a 100 to two), so the coach could try new plays. Don’t feel badly, I love you even though you are not good enough to play, except at practice for a couple of plays. These must be the same fat coaches and fat parents that I see sitting on the side at the local park, smoking and discussing how the team of 6 year olds will make it to the finals, as they fantasize Vince Lombardi or ‘The Bear”, and the national championship. There is a quote: “Sports do not build character, they reveal it.” These same parents could walk 2 miles while their child practices to sit on the bench. They could also ( heaven forbid) show their child there are other sports such as running, but then they couldn’t sit, smoke and watch. So much for character building, along with teaching the philosophical acceptance by a young child, that they will never be a Heisman Trophy winner. Oh the pain, of having one’s world come crashing down at age 7! I don’t quite see the correlation between fat, smoking parents and parents who guide their children to make the most out of the circumstances they find themselves in. 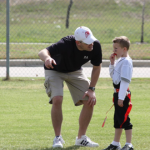 There is no doubt that there are coaches who are interested only in their own agenda, and who lack integrity in the way they lead parents and kids to believe what their intentions are, but when confronted with this type of situation, it is best to evaluate, and with intention, make a plan of action. This can include staying in the difficult situation, for an allotted time and looking for what may be learned from it. What kind of life lessons are to be learned from parents who jump at every uncomfortable situation, and either try to rescue their kids from pain by getting them out of the circumstances, or whine, complain, and start a rebellion against those in authority? Don’t blow this “it can be a learning /positive thing “out of proportion. My main emphasis was to let coaches know that they need to reward the kids who normally don’t get to play with playing time when opportunities present themselves. Coaches need to look for these opportunities and get these kids into game time experiences. 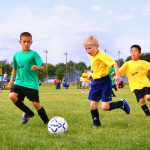 Yes, we need to try to make the best out of hard situations for the benefit of the kids, AND coaches need to know how to utilize and affirm their players as often as possible. It sometimes is harder for parents when our kids are in a hard place than it is for the child. Again, as parents we need to help our kids get through the hard times (not always bail them out) and then guide them using these experiences to improve ones in the future. Not sure what you meant by “undercurrent of absolution to the coaches” Your Thesaurus must be more extensive than mine.